Get 30 to 50% off hotels with exclusive pricing over SMS or Facebook Messenger. Number will be used to send hotel deal. No spam. Ever. Discounts up to 50% at 200,000+ hotels worldwide with messaging only pricing. We're available instantly over FB Messenger or SMS. Never hold on the phone again. We will call the hotel to negotiate a free upgrade for your stay, subject to availability. 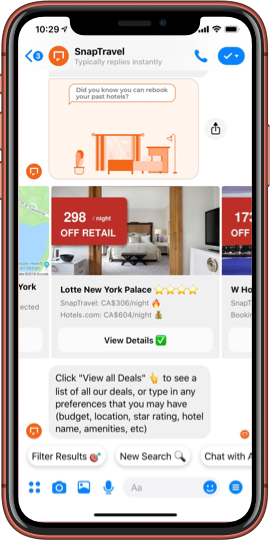 "SnapTravel raises $8M Series A in conversational commerce"
"Better rates than you'd find on sites like Kayak or Expedia"
"Why artificial intelligence is the future of travel"
Found me a really good deal and saved me $200 on a room. Loved the fast, easy service! Booked a fabulous hotel at the best price! Its the most convenient service ever! You will not be dissapointed! Begin a chat with SnapTravel and our AI powered bot will scour hundreds of sources to find you the best hotel deals. Our bot is backed by a team of human travel agent ninjas available 24/7 over chat. As a bonus, we will call the hotel on check-in day to negotiate a free upgrade on your behalf (subject to availability and approval by the hotel)! Booking a hotel is now as easy as messaging a friend. Use SnapTravel over Facebook Messenger or SMS.